Need a kick-axe gift idea for your favorite outdoorsy groomsman? Our Saw Mountain USA axe is both sleek and fully functional. It’ll come in handy at the ranch, farm, backyard or axe-throwing lanes. Free Personalization: We’ll engrave the axe handle with a name or initials for no additional cost! Our Blade of Honor Personalized Axe is a gift that your groomsmen and best man definitely don’t already have. 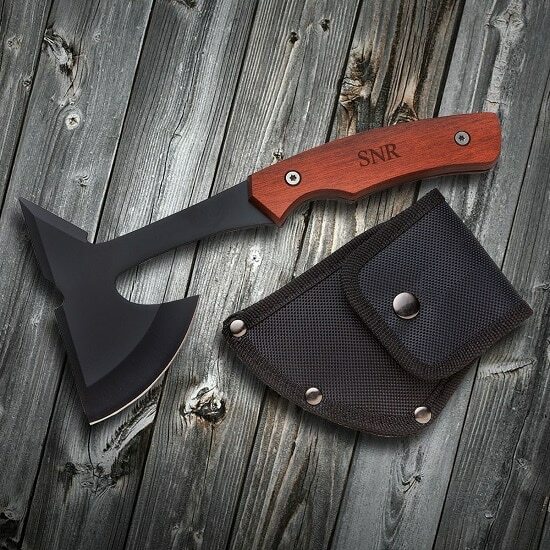 This durable axe measures 9″ long and is perfect for outdoorsmen, hunters, campers and nature-lovers. It’s great for clearing overgrown vegetation, chopping up kindling or breaking up ice when the weather turns cold. You can also take the axe to your local hatchet throwing lanes, which are all the rage right now. The compact size of the axe makes it easy to take along on any trip – and the included sheath provides protective storage. For that extra touch of customization, we’ll engrave the recipient’s name or initials on the black steel blade for no extra cost! Black nylon sheath included for safe storage. 4.75" x 2.5" 3mm thick stainless steel blade.